nancye's art and beautiful junk: Where have I been? Well, once again, I've been busy. But with what? It seems like all I do is work. But this last Sunday we went to the races. See the pictures? That's right. They are ostrich. By the time they got to the finish line, all the jockeys were on the ground and the ostrich were racing alone. I've been straightening up my studio, doing some paintings, clearing out some "I'll use it some day stuff", and trying to survive living with people. 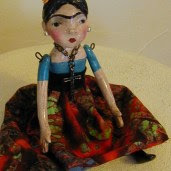 I have a few dolls made and should be putting them up for sale soon on ebay along with paintings and collages. I've been working on a corporate identity...(I need to re invent myself) press kit, thinking about opening an ebay store verses a yahoo store, and working on submitting some art for the Courage Center Christmas call as well as writing that little booklet and making healing tags (they are almost done. One more to go.) for a swap. There have been five birthdays so far this summer, and more come. I'll go broke! I'm basically tired. I'm ready for fall. How about you? Summer makes me crazy. But then again so does Spring, Fall and Winter.